Since I haven’t seen my Spyder in two weeks, figured I’d post up some new photos from when I last worked on it. 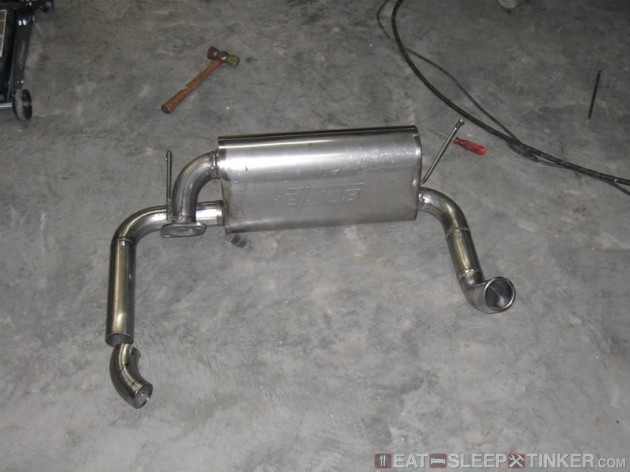 These are of the fabrication of the Borla dual exhaust. I’ve never welded, so this was a challenge. 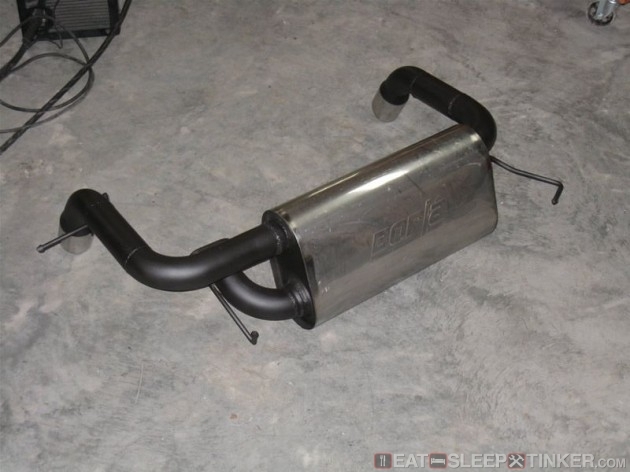 I think it turned out well, better than I’ve seen most “exhaust” shops do for me. This is just a mock up to see where the pipes need to be cut. I used steel fence wire to hang the muffler where I wanted it. All the tubing was mandrel bent J-pipes, 2.5″ and 304 stainless steel. I used the chop saw over by the door for all the cuts, a bench grinder to clean up edges, and a pneumatic die grinder for finish grinding. 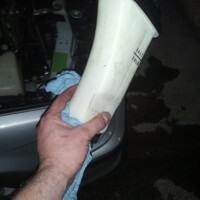 The flange to connect to the downpipe was bought from a Honda after market parts supplier, as I could not find a Toyota specific 2.5″ flange. 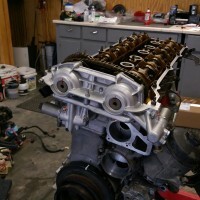 It utilizes the stock gasket and some extended length stainless bolts, nuts, washers and the OE springs. 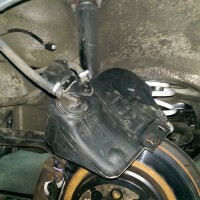 Additionally all the OE rubber hangers are used. 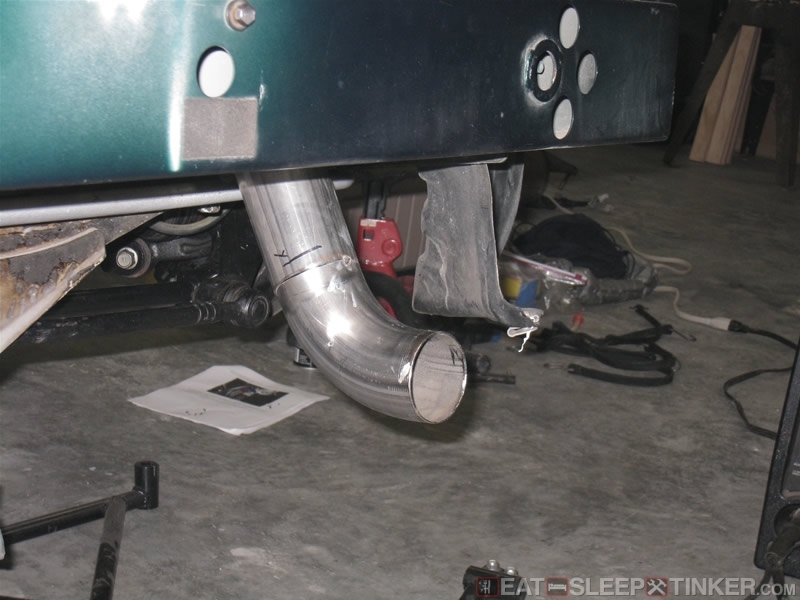 304SS rod specific for exhausts was used through the rubber isolators. Tacking on the right side outlet. I did a lot of measuring, cutting, tacking and repeating on one side. Once I had it right on one side, I used it for a template for the left side. Here’s the right tip completed and getting ready to cut the left pipe to length. A coat of high temp paint to reduce the visible signature of the pipes. While at it I also added two bungs in front of the high flow cat. I used a cut spark plug anti-fowler for the fuel trim bung and the LC1 WBO2 came with its own. I had to plug the third bung since it is no longer needed, so I cut a anti-fowler then filled the hole over with MIG wire and ground it smooth.